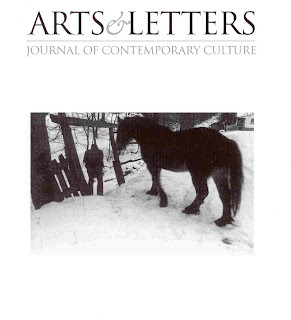 I believe this is the first issue of Arts & Letters I’ve seen, and I’m impressed. It’s a well-made book and the content is first-rate. It’s also one of the few journals that will publish drama, and there’s a play in this issue by Mark Scharf. The highlight for me here is “Careless,” a story by Kerry Neville Bakken. It’s in first person from Debra’s point of view and begins as she and her daughters are looking at a photo album and Debra is recalling a time years earlier when she and her husband were on the brink of separation. They were on a picnic with friends and there’s good natured bantering while the children wander off looking for bugs. And suddenly a kid on a motorbike roars through and since he can’t see the kids, we feel what’s at stake for the narrator. And then later, when the boy returns and speaks alone to the mother, it’s a beautiful moment. I like the character of Debra, the fact that she’s not completely likable, that she feels guilt, but also reveals softer edges. It’s a nice story. The other fiction is also engaging. “Beck and Barn” by Janice Daugharty is, we’re told in the contributor notes, part of a series. I’m not a fan of the written dialect, but it’s not too obtrusive here and I can picture old Beck as she argues with her brother The Count over whether he might have burned down her house while she was away in order to have a better view of approaching “revenuers.” And then there is “The Vanity of Open Spaces” by Stephen Graham Jones, which requires the reader’s close attention, as the two main characters’ thoughts and dialogue jump around. I wasn’t sure I wanted to work that hard, but the characters were both appealing. It might be worth re-reading. The journal includes several pieces in an “On Contemporary Culture” section and two of these caught my attention because they’re by friends. “White With Four Cuts” by Mary Beth Ray juxtaposes a traumatic visit to a Berlin art museum with experiences in her life of being cut (PAIL: puncture, abrasion, incision, laceration). It’s the disparate nature of the experiences that makes the piece stand out. And we’ve also got Ira Sukrungruang’s “Under the Hand of Buddha,” which is both touching and humorous, about Ira’s boyhood exposure to Christianity while studying Buddhism at a Thai temple in Chicago. I’m looking forward to seeing future issues. ← >God is Dead, by Ron Currie, Jr.